Neuropathy is a short term introduced for “Peripheral Neuropathy”, its meaning is nerve damage in peripheral nerves system. This disease is mainly found in old age (55+) people, it affects the nerves due to which movement, sensation, organ function and other aspects of health get affected. The disease affects three types of nerves: Autonomic Nerves, Motor Nerves and Sensory Nerves and also causes pain. It does not include nerve damage in the central nervous system and only nerves outside the brain and spinal cord are involved. Basically the peripheral nerves makes a network which connects the brain and spinal cord with the muscles and internal organs, these nerves are arranged along the lines in the body making Dermatomes. When a nerve gets damaged, then typically it affects one or more dermatomes. This damage to the nerves interrupts the communication between the brain and other parts of body preventing normal sensation in the arms or legs, hence causing Neuropathy. It affects only one nerve, it causes tingling or pain or numbness in the fingers. In this condition excessive or lack of sweating is also possible. It affects multiple nerves, normally same parts for both side of the body. People with chronic polyneuropathy, looses their ability to sense temperature and pain. Applying gentle electric current with various frequencies, using adhesive electrodes for 30 minutes daily could get you rid of pain. Plasma exchange is done to suppress the immune system activity. It involves removing your blood and then antibodies and then proteins from the blood and then returning the blood with high levels of proteins back to the body. If you have a muscle related weakness, physical therapy could help you to improve your movement. Regular physical therapy could result much better. If are caused neuropathy due to pressure on nerves like, pressure from tumors. You need to go for surgery to reduce the pressure. A research conducted between 2005 and 2010 concluded that, synthetic cannabinoids and inhaled cannabis are effective treatments for a range of neuropathy. And a range of drugs which directly acts on central nervous system has been found playing an important role in managing neuropathic pain. 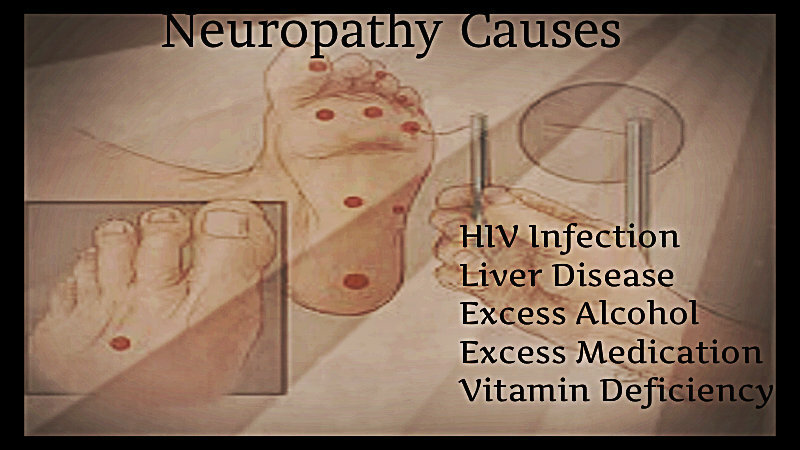 Actually, Neuropathy causes muscle loss, bone degeneration, painful cramps and changes in the skin, nail or hair. But by removing exposure to a toxin, we can halt further nerve damage. See more details of Neuropathy from Diet and Fitness.